To learn more about how your business can use retargeting to increase your sales, contact us at 800-606-1610. But Should Your Business be Serious About Pinterest? Pinterest has finally found a business model. Pinterest introduced Rich Pins on its blog. Rich Pins are packed with useful and engaging information that encourages Pinners to do more than repin (static, stand-alone) images on their pin boards. Rich Pins are distinguished from regular pins by the icon and source name that appear below the image. Currently, Rich Pins are only available for product, recipe and movie pins, but we can expect to see these updates applied to other pins in the future (e.g. travel, art and design, craft and DIY, books, music). Pinterest is a great platform for people to find and share ideas. Pinners gather inspiration, create wish lists, plan events and projects, and more on their theme-based pin boards. It is a great collaboration tool, as well. Pinterest users are able to share boards, allowing individuals to suggest their ideas by adding new pins and commenting on what has already been posted. But here's the real question. Even with the latest update, is Pinterest for your business? Before leaping into any social platform it is important to make sure that it is a good fit that will benefit your business. Here are some questions you can start with to help you make your decision. What purpose will your account serve? Are you listening or informing? Will the time put into setting up and maintaining your account be worth the outcome? If you think Pinterest has potential for your business contact us today and we'll help you get started. As the summer winds down and kids get ready to go back to school, OffWhite team members share photos of their favorite vacation memories. 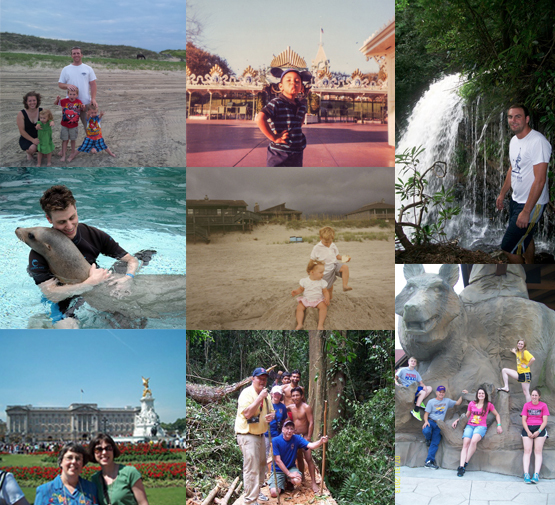 Top row, Nat with his family at the beach in Corolla, NC; Steven at Disneyland; Bobby at Blackwater Falls. Middle row: Chris at the Sea Lion Experience in the Bahamas, Jodie's family at the beach. Bottom row: Jane and her mom at Buckingham Palace, London; Bill with Marietta Rotary in Panama; Rebecca and her family at Great Wolf Lodge in Mason, Ohio. Share your favorite vacation memories with us on Facebook or in the comments. You could say we have our head in the "cloud" here at OffWhite. As discussed in our last blog, there are real benefits in using cloud-based technology. Adobe’s Creative Cloud lets us work from anywhere, with anyone, at virtually any time, because everything we need can be stored and accessed online. But keep in mind that the cloud isn’t exclusive to us "creatives." In fact, in response to the needs of our clients, we developed our very own digital marketing platform, Ed.it™2, to operate in the cloud. Our platform reflects our investments in digital innovations and the creation of tools that help our clients manage their email marketing, social media, websites and more. Our Ed.it™2 modules are displayed in an elegant interface that acts as a digital marketing dashboard. The power of these intuitive tools and the fact they can be accessed all in one place allows our clients to launch, control and monitor their digital marketing communications— whenever, from wherever— without any programming knowledge. To learn how Ed.it2 can simplify your digital marketing efforts, contact us today. Offenberger & White, Inc. (OffWhite) is an integrated marketing solutions company based in Marietta, Ohio, USA. ©2018. Offenberger & White, Inc. All rights reserved. Terms and conditions of use apply. P.O. Box 1012, 521 Fort Street, Marietta, OH 45750. 1-800-606-1610 or 1-800 OFFWHITE.